In the last post of this series, we introduced some statistical concepts useful to analyze and to optimize the composition of a portfolio of projects. In particular, we have characterized projects as black boxes, which absorb resources and generate returns. The returns were expressed in the form of a probability density functions, which are easily obtainable through Monte Carlo simulations applied to high-level planning of projects. As a consequence, the only variables of interest to characterize a portfolio, are the average returns of projects and their associated standard deviations. The returns tell us how much projects are profitable on average, the variances tells us how much the average returns are uncertain. Another measure, introduced in the last post and which will be extensively used here, is the covariance. That is, a quantity, dimensionally identical to the variance, which indicates the mutual behavior of two random variables. In this post, we will see how to describe a generic projects portfolio's average profitability as a function of the associated uncertainty, starting from its composition and considering, for each project in the portfolio, the notions of average return, return's standard deviation and covariance. The concepts presented in this post are largely derived from modern portfolio management theories introduced by Harry Markowitz and other economists, beginning from the first part of the ‘50s. For a full theoretic comprehension I recommend you to take a look at the two articles listed below. Since the mathematic used in these articles is a little bit complex, especially if you do not have an engineering background, I will provide a simple explanation in the next part of the post. The articles are mainly focused on the selection of efficient portfolios of securities, considering interest rates and volatility. We will apply the same theoretical background in project portfolios management applications. Let’s start considering, for sake of simplicity, a simple two projects portfolio. This can be done without infringing any generalities and will allow us to have a very straightforward discussion about the topic at hand, with the aid of simple graphic examples. The two project constraint will be removed in subsequent posts of this series. Take a look at the first part of Figure 1. Let’s define some reference variables for each project and for the resultant portfolio. 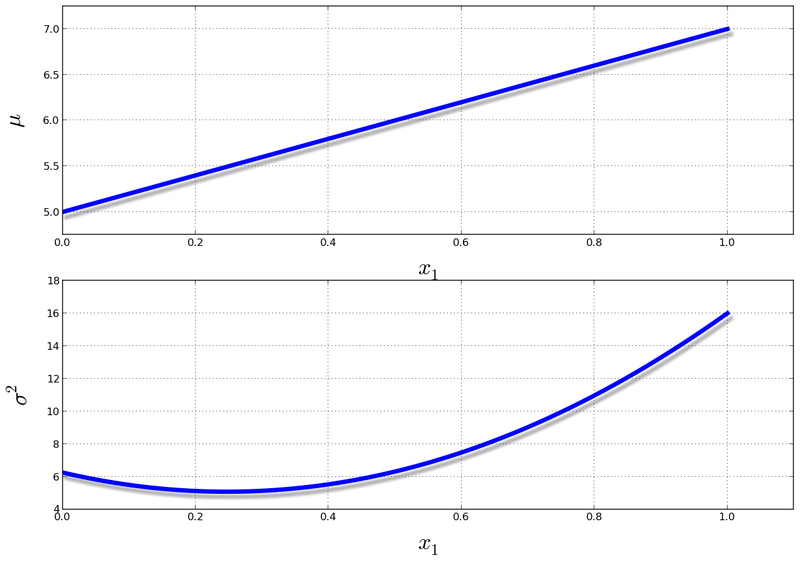 Return PDF is the return probability density function (PDF) as defined in the last post. Average Return and Return Standard Deviation are the mean value and the standard deviation of the PDF (so they are the mean return and the associated uncertainty) while Projects Covariance is the covariance between project 1 and 2. Budget Percentual is the percentual that one invests in each project and, as a consequence, 1 is the percentual invested in the current portfolio. Boundary Condition accounts for this preposition. As an example, if one whishes to invest 100000 dollars in the portfolio and x1=0.635, this means that 63500 dollars will be invested in project 1 and 36500 (x2=1-x1=0.365) dollars will be invested in project 2. In the second part of Figure 1 we find some Equations. Equation (a) is the return of the current portfolio, evaluated as a linear combination of the returns of project 1 and project 2. This variable is a PDF, being a linear combination of probability density functions. Equation (b) is the average return of the portfolio. Equation (c) is the variance of the portfolio’s return. At the bottom of the post you will find a series of slides that explain how to get equations (b) and (c) starting from equation (a). I did not post the slides here to avoid encumbering the discussion. Equations (b) and (c) are functions of two variables but, since the boundary condition that we discussed before, they can be described as functions of single variable. Since the summation of x1 and x2 must equal 1, one of the two variables could be substitued with 1 minus the other one's value. So, after having fixed a value for x1, we can substitute x2 with 1-x1. After this change, equation (b) and (c) of Figure 1 become the new equations (b2) and (c2) in Figure 2. In this new form they can be easily plotted on a bidimensional graph, as the one depicted in Figure 3. On the left we have a plot of the average return of the portfolio (equation (b2) of Figure 2) against the budget's percentual invested in project 1, while on the right we can see the portfolio return's variance (equation (c2) of Figure 2) plotted against the same variable. How can we use this 2 graphs? It is quite simple. We have to choose a budget's percentual to invest in Project 1 and read on the y-axis of the two graphs the expected portfolio return and its variance. However this has two drawbacks. It forces us to look at two graphs to gather the information we need and the variance has a different unit of measure than the average. 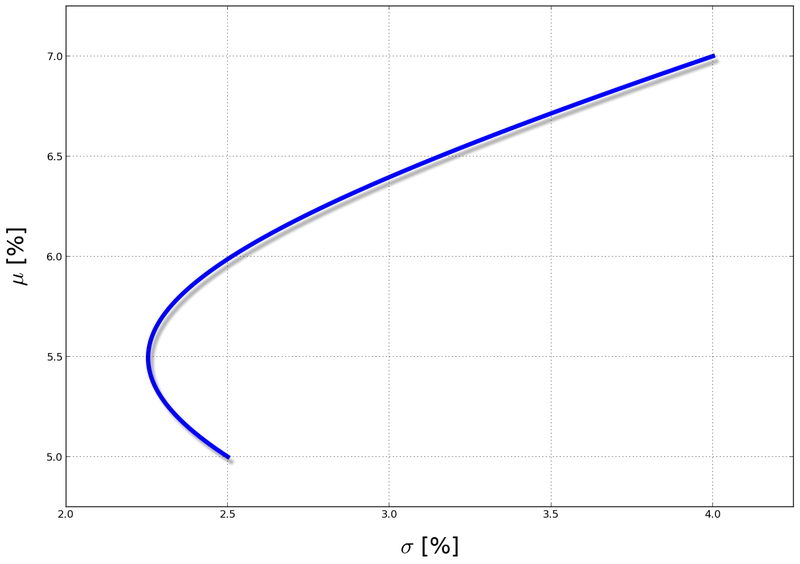 Since equations (b2) and (c2) on Figure 2 share the same domain, being both of them defined as a function of the percentual of budget invested in project 1, they can be plotted one against the other on a single graph, as the one presented in in Figure 4. We also take the root square of the return's variance, obtaining the return's standard deviation, that has the same unit of measure of the average return. Finally, on Figure 4, we see what is called the efficient frontier of the given portfolio. That is to say, the locus of point of maximal efficiency for the portfolio. The utilization of this graph is straightforward. As an example, we can decide a portfolio’s average return, check the associated standard deviation and see how to split the available budget between the 2 projects. We will be sure that there would be no better allocation, in the sense that, considering the projects at hand, we could not obtain a portfolio with a higher return and a lower or equal associated standard deviation. In the next post we will reprise the discussion from the efficient portfolio frontier and we will go a little more in depth on its utilization and interpretation.